So I briefly mentioned Ink Road Stamps since I'm giving away a set they make. They're a really fun company with plenty of unique funny and snarky (💖💖💖) sentiments! Click on the link above to check them out. 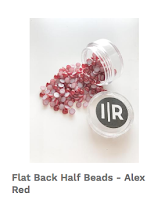 In a slightly unrelated turn of events, they ran a naming contest of their newest embellies (half pearls) in their Facebook group. I thought the suggested name would be the winner...not the actual PERSON making the suggestion, but hey I'm not complaining! 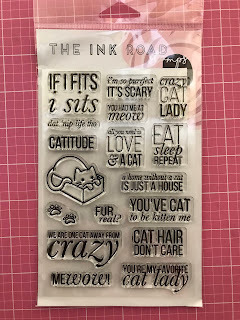 Aaaaanyway...today's card uses an Ink Road stamp set called Meow Mix (Don't you just hear Dr Evil singing the jingle every time??). 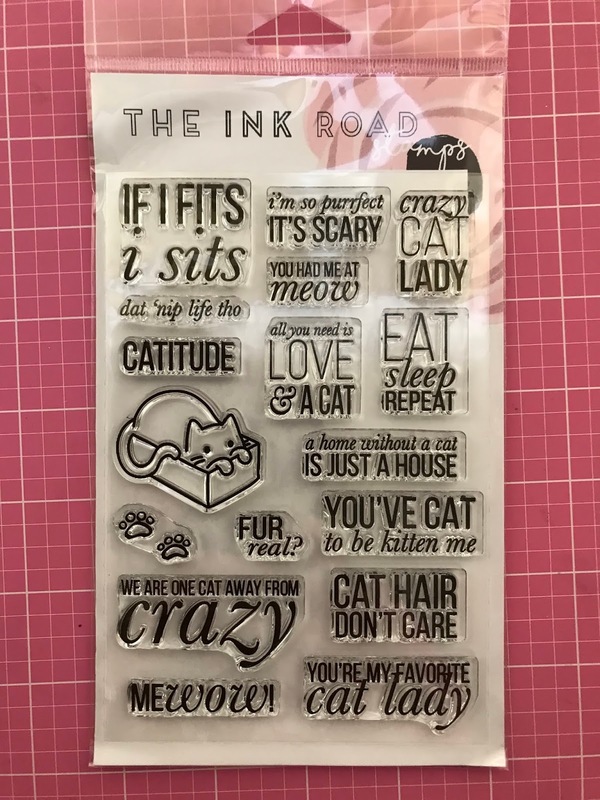 Meow Mix is one of those mix and match cat faces type stamp sets. Well a certain Small Crafty Dude was naughty and after confiscating all his tech (and there's an awful lot) I decided to put him to work given my looming deadlines and had him stamp cats. Well this is what you get when you ask a disgruntled SCD* to do something. After hissing some death threats, eventually I got at least 3 useable cats. I did have to add white pupils on the middle one. SCD* said "argh those eyes are soooo creepy! They're gazing into your soul and plotting ways to kill you" OK I didn't think they were QUITE that terrifying, but whatevs. I used the packaging technique when experimenting with the Distress Oxides the other day and got these backgrounds. One has some resist spray used with a stencil, but the resist doesn't seem to work all that well with the stencils and definitely not with oxide ink unless you use droplets. I need to look into it more. 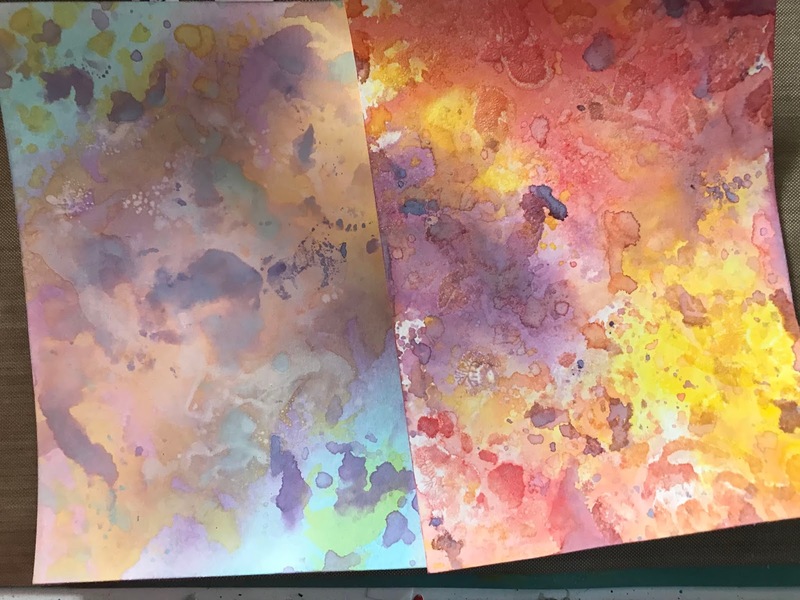 Aparently the man himself (Tim Holtz) says if you aren't happy with your background, you aren't done yet and need to add more. Even the queen of the more-is-more-is-more philosophy was dubious, but I persisted and he's kinda right! I use the background I liked better with some older dies from Taylored Expressions and a Stampendous sentiment. Simples, right? But wait! There's more! This morning I woke up at about 4am and had the most genius idea. 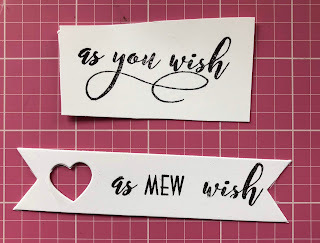 What if I spliced "Meow Mix" with another Ink Road stamp set called "As you Wish"??? It's a Princess Bride themed set and well...everything seems like a good idea at that hour, right? Now for the Westley cat...if I use the sunnies and touch them up with black and white pens...and cut the sides off...along with a very serious expression. Princess Buttercup was much easier! 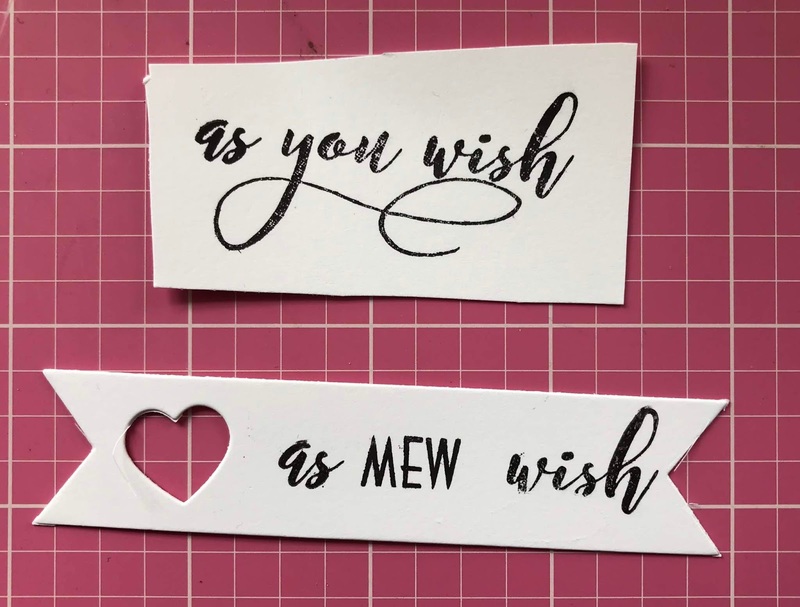 I know I didn't really centre the "mew" very well, but I cut it out with a die by Shimelle. These will definitely go on a card, but not until I get some of Shimelle's newest collection called "Head in the Clouds" which has castles and dragons and all the good stuff! Now for the Giveaway (closed)! Even SCD says he always looks stoned in every photo. Haha, oh my gosh, your gray kitty does look like he's gotten into the catnip all right! 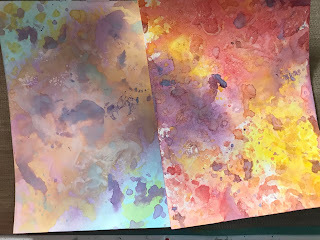 Love the Distress Oxide backgrounds and may have to break down and get some of those Oxides of my own,sigh. 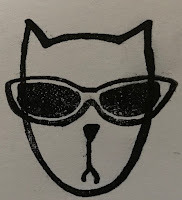 Your kitty mix-and-match designs are adorable and I love the glasses! We're not sure where he stashes it. but we can tell every time he's been "using"! I was so disappointed there where not going to work in the small size - will be cranky if they resolve that issue! I definitely need more practice with them, though. Love your background, those kitties are so adorable and have done all the above. Thanks so much for your words, visit and entry! It means a lot! Thank you! 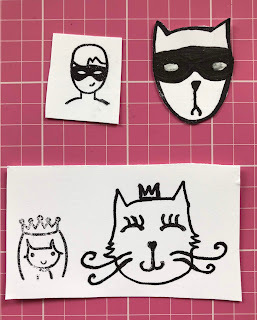 Things in threes seem to word well for the dimensions of a standard card with that size of image and I certainly wasn't going to use any of the possessed looking cats a certain small person created! Love your projects! They're too funny and very gorgeous! Your colouring is great!!! Thanks for letting me know your details and entering. I appreciate the love! Thanks again for your kindness!!! Oh this made me laugh! I actually did buy a dog chew toy for a certain bitey grey cat! I so want to watch PB now Cary Elwes is so easy on the eyes and how young does Fred Savage look? lolol...except the boys have rigged up the TV and Netflix through some impossibly complicated system and I'm the only one awake as usual! I will definitely check out your post! I would LOVE to see your project if you case it! That's hilarious... nip habit, got to say, do agree your kitty does have a certain 'look' about him!! Your card is just stunning! Love those kitty faces - you did well! They are so cool though.. and the background papers - gorgeous! Thank you! He's completely crazy! You should have seen him after the vet had to give him an injection of an opioid once. He wasn't sedated like they said he might be, but he was completely off his face! I giggled all the way through your post. Seriously, you're a hoot! I love the idea of the mix and match cat face and the "out takes" from SCD*. I've yet to master Distress Oxides but I suppose listening to "God Tim" is the way to go since yours turned out really cool. 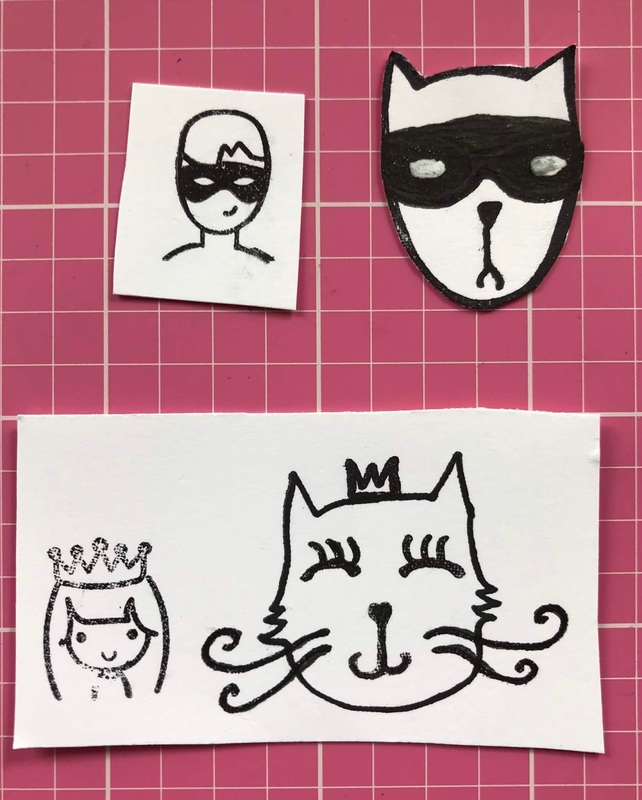 Love the kitty princess, too and the way you've masked the sentiment. Look forward to that one, too. I did the stuff you asked on the previous days comment. Thanks for the chance to win! xxD Goliath is on my lap and says he'd like some of that "nip", please. And I love your card ... not looking very evil to me, either. Thank you! We all wear glasses...(at least Small One is supposed to but doesn't!) Glasses seem to look so good on cats. I guess they're intelligent beings and glasses just emphasize it? IDK. The next card also features a cat with glasses! Your post made me smile. Love the kitty faces. Thank you! All the love for the faces here and on socials got the small dude his tech back so he is grateful!! I think you may be right! He's not COMPLETELY silly, but definitely not the cleverest of cats (he often has scrapes on his belly from getting into a Winnie the Pooh situation) but he's sweet and craves people contact! Oh dear, off to nip hab with the kitty! Hahaha! Your little helper did a great job. I think the card turned out great and I love the glasses. He says he can quit anytime he wants lolol The helper got his tech back on friday after school thanks to you lovely ladies! 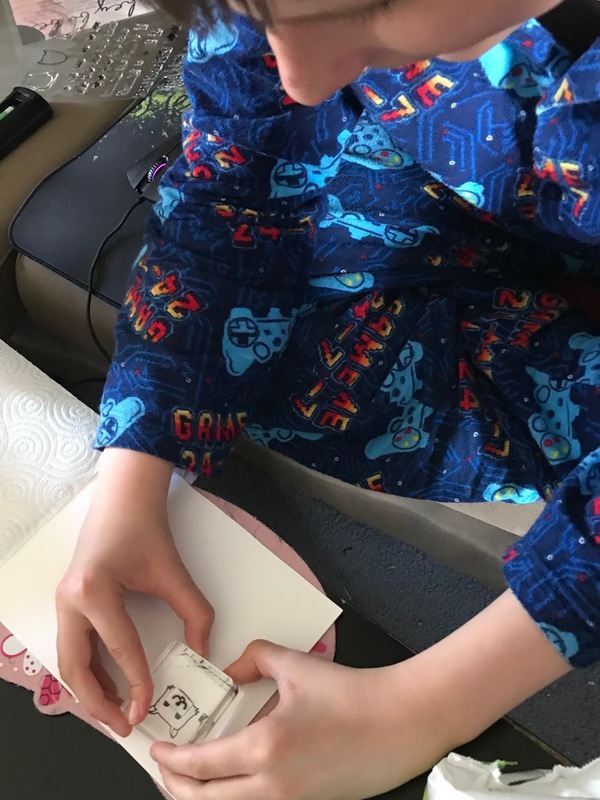 He wanted to game with his friends and being an only child I tend to let him. Thank you so much! Fantastic background - and I love those stamps! Why do ideas always come at 4am? Or the shower or toilet or whatever. Thank goodness for waterproof phones. I take mine into the shower and can note down ideas! I love your work too! I will have a better look now that I've finished these projects. My next challenge is breathing down my neck, I'm not sure I could work any other way! Thank you so much! Even the initially reluctant helper got into it after a while! Thank you! Fitzy is hilarious. Last night we discovered cats get the hiccups. All the weird stuff happens with him! I love your salute to The Princess Bride! This card is fun and colorful! I became a blog follower today too! 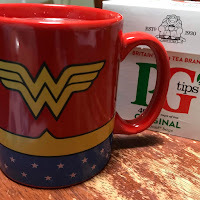 Thanks for your entries and the blog love. I need to think a bit more on how to make the Princess Bride pieces work on a card since they're only heads. that is so wonderful card! Thank you! In the end my helper enjoyed it too, but he would never admit it! so fun! love the story! Cool background! Love your card! My internet is finally working again, for the moment! It has been down or spotty for the last several days. What a fun post, Alex. Congrats on having the embellies named after YOU! Wow.....you are famous!!! Love the cats your helper made for you...would have enjoyed seeing even more of the rejects...Ha! Your card is just wonderful. Looking forward to seeing that Princess Bride project when it gets done. 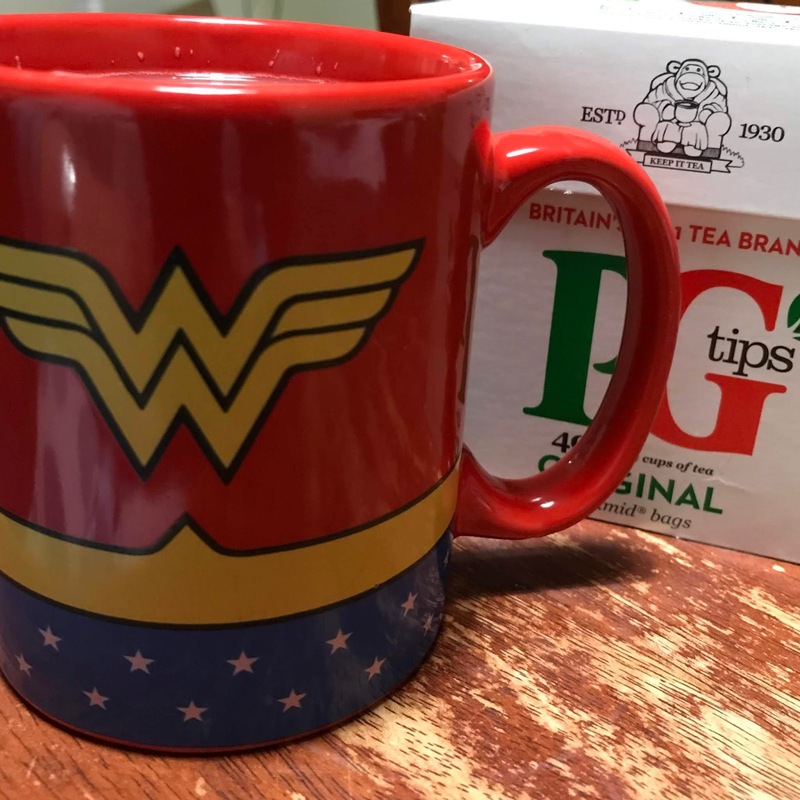 :) I am probably too late for the giveaway on this post, but I think I did get some entries in on your first post...before my internet abandoned ship!! Thank you for adding to the fun.